Gulshan Bellina is an avant-garde space handpicked for peaceful living away from humdrums of noisy city. Located near the Noida-Greater Noida Expressway, it is well connected to NH-24. 1100 m commercial belt is planned nearby along with metro connectivity. The plush settings are marked with awesome manicured greens, exuding opulence in their simplicity and neat cuts. Uncomplicated in design, contemporary that is smart and practical, Gulshan Bellina Noida has 2 and 3 BHK apartments that cover 1020-1745 sq. ft. areas. Fed by non-stop water and power, and paid out with smart architecture, these abodes are happy private zones that will be much cherished for the simple and modern life that they provide. There is spit a/c in all rooms and smart open modular kitchens in each dwelling. Chic fittings create an elegance that is ‘owner’s pride’! The gamut if facilities here are purely for the satisfaction of a fit and health conscious happy community. Unisex gym, welcome lounge and coffee shop, kids lounge, amphitheater, steam/massage room, swimming pool, indoor and outdoor game zones and sports courts and jogging tracks are well-laid out. There is a convenient customer care centre, laundry services, stretcher lifts, in-compound OPD and wheelchair for sick and elderly. Green installations make up an eco-friendly lifestyle. Gulshan Bellina Price is quite amazing. 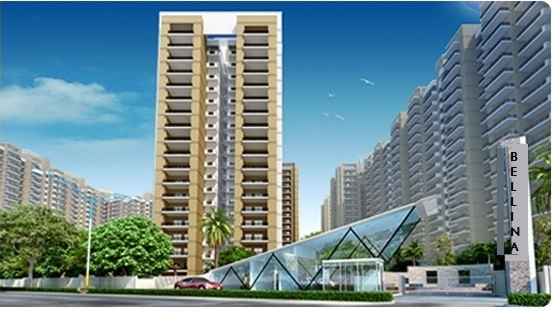 Rs 32.89 – 56.27 lacs are the price-point ranges for possessing a fancy condominium here. Set to be an elite destination of the future, the project is a smart choice to put your money into for good returns. FLOORING: - Vitrified tiles in drawing, dining, bedrooms and kitchen. DOOR & WINDOWS: - External doors & windows made of Aluminium. KITCHEN: - Single-bowl stainless steel sink. SUPER STRUCTURE: - R.C.C. frame structure. Located at Plot No. GH-02A, Sec-16, Greater Noida (W). 17 min from South Delhi.